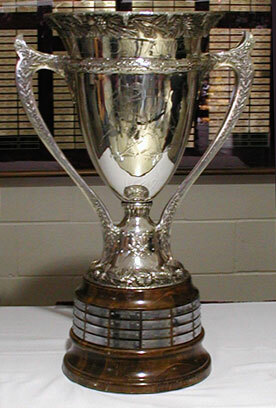 The MacNaughton Cup is awarded annually to the regular season Champion of the Western Collegiate Hockey Association (WCHA). The Cup, is hand crafted of pure silver and stands nearly three-feet high and weighs some 40 pounds. It has the words "American Amateur Hockey Association" inscribed near the top of the cup above the handles. Etched into the front center of the cup are two hockey players. The Cup has pine cones, pine needles and icicles around the top rim and base. The front base has crossed hockey sticks and skate blades. The back base bares the name "James MacNaughton Trophy". When the Gophers were members of the WCHA they were the regular season Champion 14 times (1953, 1954, 1970, 1975, 1981, 1983, 1988, 1989, 1992, 1997 (c), 2006, 2007, 2012 and 2013 (c)) and won the MacNaughton Cup 13 times. In 1983 the MacNaughton Cup was not part of the WCHA, see the write up below for more explanation. James MacNaughton was President of the Calumet and Hecla Mining Company of Calumet, Michigan. MacNaughton, an avid supporter of amateur ice hockey, in 1913 authorized the President of the American Hockey Association to purchase a cup to be awarded to the Associations Champion at the end of the season. The MacNaughton Cup remained with the American Hockey Association until 1932. From 1933 to 1950, the Cup was fought for by semi-pro and intermediate hockey aggregations in Michigan's Copper Country. For more information on past winners of the MacNaughton Cup or Michigan's Copper Country hockey, please check out Copper Country Hockey History. In 1951, the MacNaughton Cup was donated by Calumet and Hecla, Inc., through the generosity of Mr. and Mrs. Endicott R. Lovell, to the newly-founded Midwest Collegiate Hockey League (MCHL) a forerunner of the WCHA. Mr. Lovell, son-in-law of James MacNaughton and President of the company at that time was also an avid supporter of amateur ice hockey. The MCHL was comprised of Michigan Tech, Colorado College, Denver, Michigan, Michigan State, Minnesota, and North Dakota. Michigan Tech University became the trustee for the MacNaughton Cup. In the original spirit of the trophy, the league decided to award the trophy to its regular season champion. In 1953 the MCHL became the Western Intercollegiate Hockey League (WIHL). The MacNaughton Cup remained a part of the WIHL until the league was disbanded in March of 1958. There was no league play for the 1958-59 season (though most of the WIHL teams played home-and-away schedules). In 1959-60, the seven original MCHL/WIHL teams resumed formal competition under the new name of the Western Collegiate Hockey Association. During the 1961-62 through the 1964-65 seasons the Cup was awarded to the the WCHA's Playoff Champion instead of the regular season Champion. 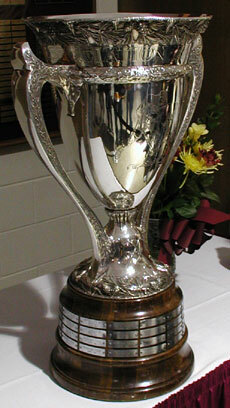 From the 1965-66 season to the 1981-82 season, the Cup was again awarded to the WCHA's regular season Champion. The 1981-82 season saw Michigan Tech University leave the WCHA to join the Central Collegiate Hockey Association (CCHA). Since Michigan Tech is the trustee of the Cup, the Cup went to the CCHA also. When Michigan Tech returned to the WCHA for the 1984-85 season the MacNaughton Cup also returned.